I have a tin from your company from when I was a child. I would like to send a photo to see if worth anything. I am not able to attach the photo. Would you take a photo? 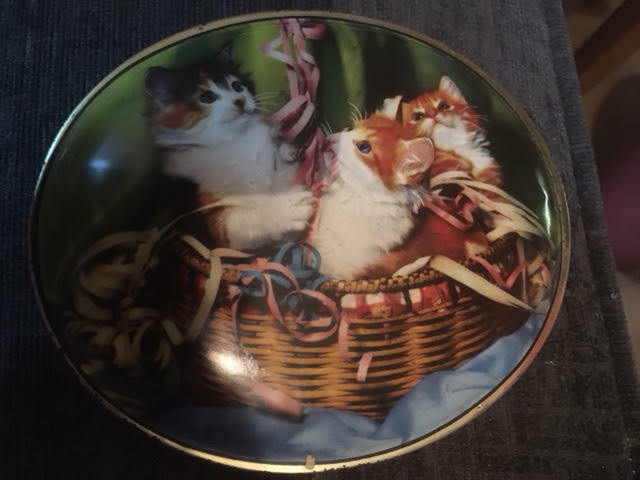 I have a tin made by Edward Sharp & Sons of Maidstone Kent, featuring 3 kittens in a basket. Could you provide a date for me as to manufacture. We have a tin box of toffee with a picture of the Château Frontenac in Québec City, dating probably in the 1930. I have an old toffee tin with a picture of a Native American wearing a headdress, beaded gloves , carrying a pipe, I think the picture is the famous Grey Owl otherwise known as the British born Archibold Belaney , he was over in England in the 20s and 30s , I have a picture of the Tin but unable to attach a picture, do you have records that the image is the individual I have named, or can tell me anything more on it, hope you can help Mark. My Grandmother Daisy Peverley’s Cousin was Winifred Peverley who Married Sir Herbert Sharp. My Gran used to Receive a Lovely Tin of Toffees every Christmas from the Family. Thanks for sharing Nick. Do you know when these toffee gifts stopped? When the Sharp and Sons was acquired by Trebor in 1961. I used to keep all my Dinky Toys in those Tins to play with when i visited my Grandmother Daisy. I think they all ended up going into the Jumble Sale. My Mother Joan does not remember her Great Cousin Winifred Sharp now at the age of 93yrs with Dementia. I have the same kitten tin that’s listed here. My great Uncle gave it to me when I was a child. I’ve carried it all over the world with me, so I was surprised when I saw the image here.